My daughter has just moved into a house that was unoccupied for 12 months. The lawn was really a meadow with what looked like several years of neglect. I used my petrol rotary mower ‘Champion 375′ on the highest cutting setting. The varied height ability was very useful. After raking some dead straw from the grass it was cut again at a lower setting. When I have left it for a week to settle then it will be cut on progressively lower settings. Fortunately I can also use a mower with a heavy cylinder to level out some of the little bumps. Shortly a weed and feed application either granules or liquid will probably be applied. I am not rushing this as I want to get the lawn into better shape without chemicals. The problems then start encouraging my daughter to take over the maintenance. How will my daughter cut her new lawn without the tools? Well I recommend a lawn mower from the cheap end of the range. Amazon sell a Flymo Lite Electric Hover Lawnmower at £56.99. The lawn isn’t too large and a short extension flex will cope. This hover mower is made from lightweight polypropylene and features plastic blades with a 28cm cutting width. This 1000w electric lawnmower has a hover action that makes it easy to manoeuvre when cutting and also has 2 cutting heights. There is a fold down handle for easy storage and is quite light. A goat may be a cheaper alternative way to keep the lawn mowed but somehow I don’t think that would go down too well. 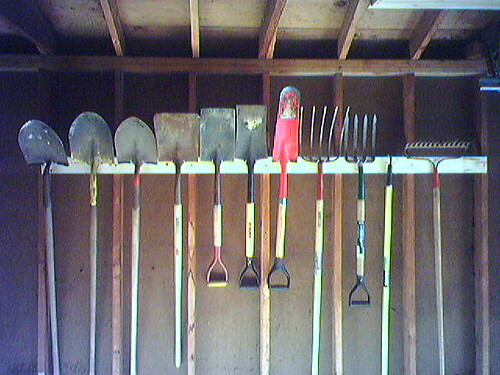 I have just returned from my local nursery with a stock of new canes. I must now weed out the poor and damaged canes I have left over from previous seasons. 2012 is the year I resolve to support my plants better than ever before. Well now my plants should be able to perform with the aid on my new cane, string and net supports. Too my surprise Amazon now supply or arrange to supply canes in volume via the web – it makes transporting the 7-8 foot ones in my car a thing of the past. There is one further job I must do. 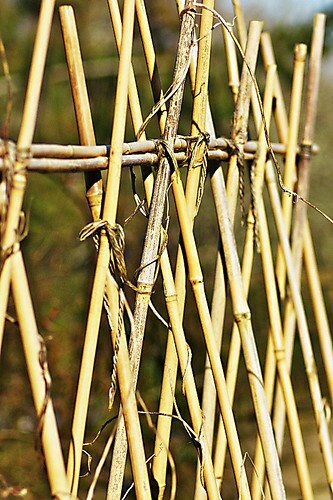 I have a clump of bamboo that would benefit from some aggressive thinning out and I hope to get some 3-4 foot canes from this exercise. The Hazel has already provided this years crop of stems to use as further supports. Still the best canes are my Raspberry canes but I have a sweet tooth. This year I have found 3 trowels when emptying and spreading my compost heap. I am not claiming that a tool belt or pocketed apron would have prevented me loosing them in the first place but you never know. Apart for comments about the small size of this apron it gets good reviews from Amazon buyers. They are particularly happy with the price (£8.25) and the functionality. I have no discernible system and carry my secateurs, string and bits and pieces in numerous pockets of an old gardening jacket. When I get warm the jacket comes off. As I say no system. 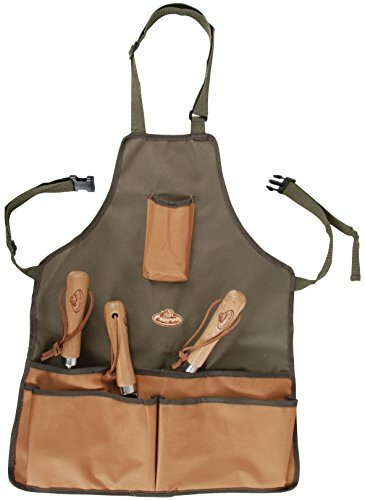 There is a wider range of Aprons available from Amazon. There are some Laura Ashley ones for ladies and some more robust ones that the picture above. Have a look at the range. carry tools but also a mobile phone and note book and pencil in a dry zippered pocket . protect me from sharp prickles and cutting leaves and stabs by my own tools. keep my gardening clothes protected from the worst of the dirt. keep out of the way of my activity and actions. Looks like I will have to belt up! 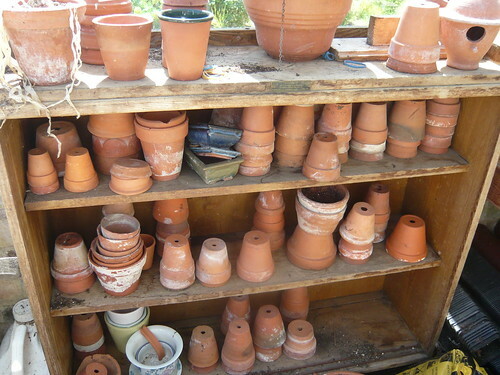 I like UK made terracotta or clay pots. Good pots are made frost hardy and should last through all the British seasons. Imported pots have often been made in warm climates where they do not know the meaning of cold never mind frost. Old pots do sometimes collect a white salt deposit on the outside. You can see that on the photograph or the old pot collection above. As long as the pot is washed in a solution containing a disinfectant they can be reused indefinitely. Pots are porous and let in air to the roots. Evaporation from the clay pot keeps the roots cool. Plastic and particularly black plastic boils the roots of your plants. Avoid pots getting top heavy in windy conditions. Too much plant growth can get caught by a wind, blow the pot over and smash the pot. For tall plants weight the bottom of the pot. Pots can freeze to the ground and this weakens the bottom of the pot until it falls off. Use bricks or special feet to stand the pot on during winter. Keep the outside of decorative pots clean or algae and moss will be encouraged and discolour your pot. If you want to artificially age your pot coat it in Yoghurt to encourage green algae growth. any number of plant pots. 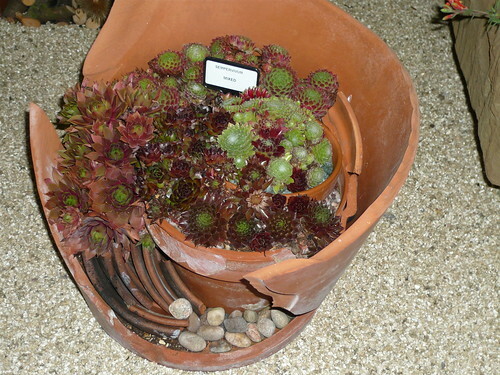 They come in all shapes and sizes but terracotta pots are few and far between. Perhaps it is because they are heavy and expensive to deliver, all the more strange that we see Chinese pots in many garden departments at DIY stores. If you break your pot do not despair you can make a feature like the one below. 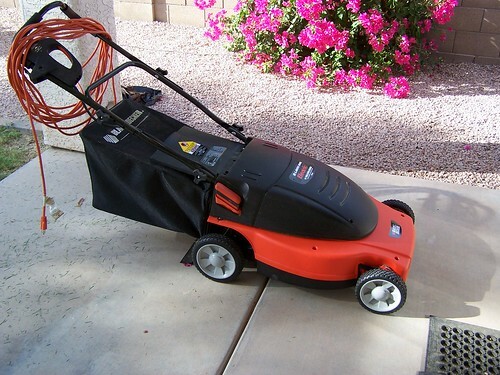 Hover mowers are quick and easy to use but they do not leave stripes in your grass. Use hover mowers to keep your grass tidy but consider a cylinder mower for a top quality look to your lawn. The special mowers for long grass are an excellent way of clearing space like a hovering scythe. The electric Hover mowers are fine for small lawns and are far lighter than most other lawnmowers but they are unlikely to collect up the cut grass. When mowing a bank or slope stand at the top, attach a rope if you need too then swing and lower the mower. Mow up and down not across a slope and take extra care on any uneven ground. Read the instruction book, it may seem obvious but best to be prepared. Fill the petrol tank before you start as pouring petrol into a hot engine can be as dangerous as smoking. Examine the area to be cut for stones, bits of metal, toys or pets. Set the cutting height, not too short! When starting the machine keep it still, perhaps by putting your foot on the hood. Hover mowers do not have wheels so they must be carried onto and off the lawn.Lift with care and buy one that is light enough for you to manage. 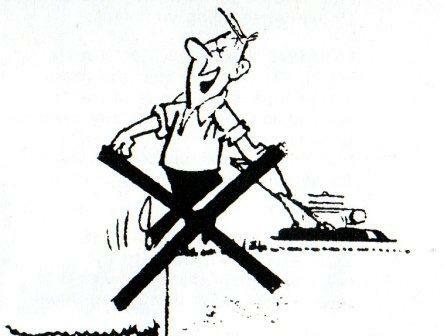 Wear heavy shoes with a good grip and keep children away from dangerous machinery. Do not carry the mower whilst it is running it will not float from one lawn to the next. Keep the mower flat as it is designed to stop ‘flying stones’ by hovering close to the ground. Do not mow over gravel. 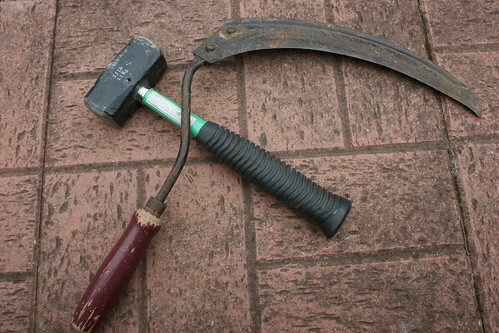 Do not try to use your mower as a cultivator some areas may be so overgrown they need a machete. Don’t take risks or walk backwards as you may pull the machine on top of you. 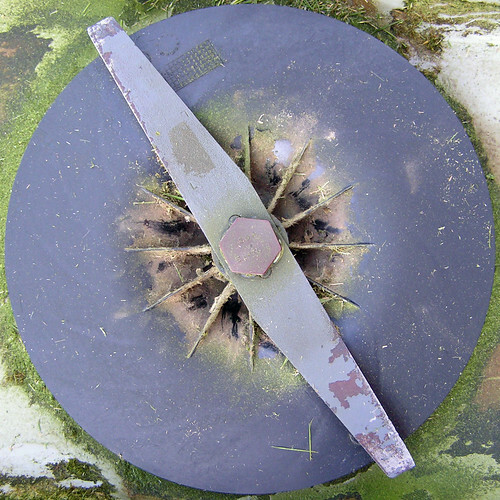 The photograph of a rotating blade is under a creative commons license 2.0 by Jovike. See also Gardeners Tips for more safety advice. These Gunnera leaves have been used as a natural frost protection. Before the first frosts, you can place some straw over crowns of plants and keep them in place by the giant leaves. 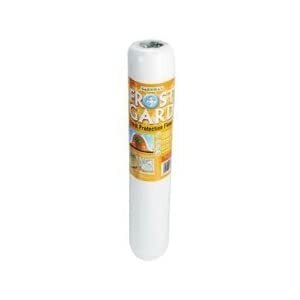 This helps to offer some frost protection which should help them survive the cold of the year. As an added advantage it also looks quite attractive in its own right. Horticultural fleece is a simple but effective tool to wrap around individual plants or cover a row of tender plants / vegetables. Horticultural fleece can also be a great way of protecting plants and vegetables from pests such as cabbage butterfly. This is a more expensive way of buying fleece, but, maybe more convenient for a small number of plants or pots. Tips on Using Garden Fleece. Make sure it is well pegged down. 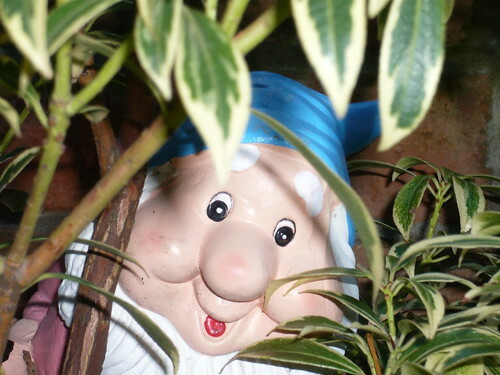 Take advantage of any natural frost protection such as moving pots to a sheltered south wall. Remember fleece protection will keep temperatures higher, but, it cannot guarantee against frost. For tender plants, you have to keep them inside. These Iris Unguicularis have been placed against a south facing wall in a dry, free draining soil. A good free draining soil is often as important as protection against cold. A combination of wet and cold can be much more damaging than just frost. Begonia plants are often the first to succumb to air frost. get the corms inside and protected for winter before the ground is also frozen. Dahlia leaves go black as soon as they are bitten by the frost bug. Then is the time to cut down the haulms and dig up the tubers for winter storage in dry frost free conditions. 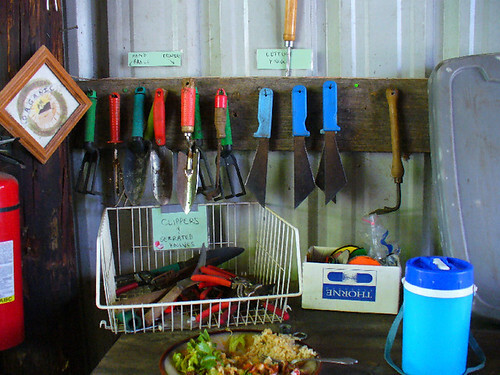 The first and most essential item of equipment for a gardener is a sense of humour. How else can they expect to cope with weather, insects, disease and death. If you have had an endorphin bypass then give up gardening and take up nuclear physics or something else equally less challenging. An assistant gardener is a bonus piece of equipment and hidden in the shrubbery is my no.2 helper. (My wife is no.1 as she cuts the grass, edges and much more). Some ‘gardeners’ have a professional to do the hard work and this doesn’t disqualify them as gardeners but the armchair variety is not as hardy as the all weather species. Lawn Rake with tines that can collect leaves and hedge trimmings from grass or in this case paths. 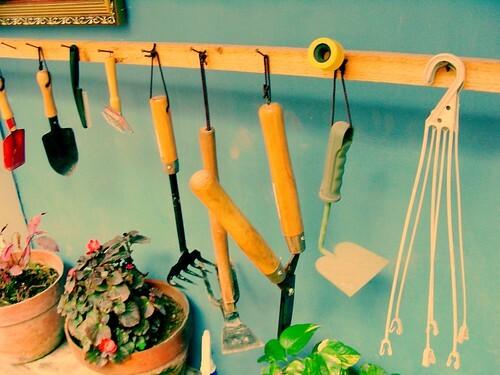 A long handle on most garden tools makes life easier. 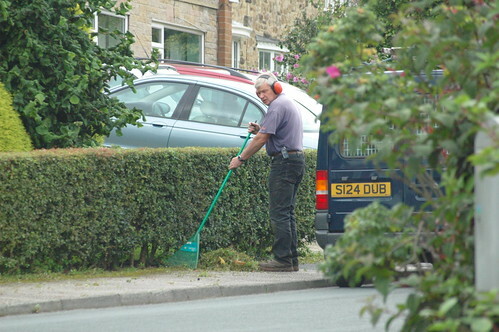 Ear Muffs are not strictly essential garden wear but if you use noisy machinery for a long period they would be worthwhile. Hedge trimmers, wood chippers and some lawn mowers are noisy and so are the sounds of these tines on the path. Like all plants, lawn grass needs air, water and nutrient from the soil. Too often these resources are lost to the grass as a lawn gets compacted by walking and playing on the lawn. Water runs off compacted ground and doesn’t soak in. Air is crushed out and worms that would help aerate the soil are not tolerated. Soil can become sour and lacking in nutrient despite seasonal fertilizers. 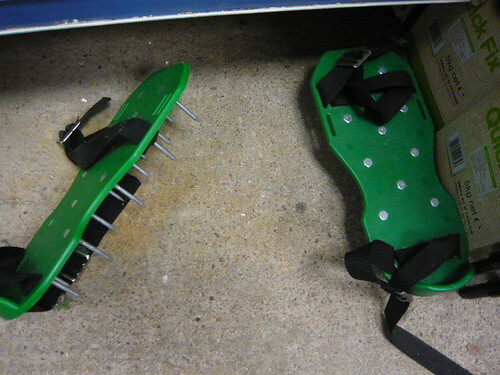 One solution is to spike the grass as you walk on it wearing the shoes as shown in this picture. Hollow tyned forks are good for removing a core of soil to leave a short tunnel for water and air to penetrate the soil. Professionals have special aerators for large areas like sports fields and bowling greens. Amazon have a range of Aerators from the shoes to the wheeled roll up and down types. A wide spike is better than a narrow spike. Narrow holes fill up quickly.